Students and tutors from the Otago Polytechnic Arboriculture course spent three days at Craigieburn undertaking some essential work on the reserve’s trees. The students removed deadwood and damaged branches from the large macrocarpa shelter belt in the main paddock. The programme is the second year of three-year partnership between the Otago Polytechnic and the Craigieburn Committee where the site is used for training purposes. Craigieburn Project Manager Paul Pope asked the students to put their climbing skills to the test and inspect some of the rimu canopies while he bravely gave words of encouragement from the forest floor. The trees range in age with the oldest being around 550 years old and the students inspected the trees for wind damage, disease and rot. Around 16 of the 52 rimu were climbed and in general all were in good condition. So we may get at least another 300-350 years from these wonderful trees. Otago Polytechnic Arboriculture tutor Matt Miller said that getting the chance to climb such old native trees in an urban context was a rare and an important opportunity for the students to experience. It was a real pleasure to have the students utilise their skills at Craigieburn and we look forward to having them back next year. Click on the pictures below for viewer. The recent damage of the sea wall at St Clair Esplanade is a pertinent reminder of the power and ferocity of the ocean and the continuation of an issue that has been prominent in Dunedin since the beginnings of colonial settlement. The extension of physical occupation of coastal areas by people and the development of infrastructure around that occupation has been fraught with problems. Worse still has been the undermining of the important protection afforded to the city by the St Clair and St Kilda beach areas. 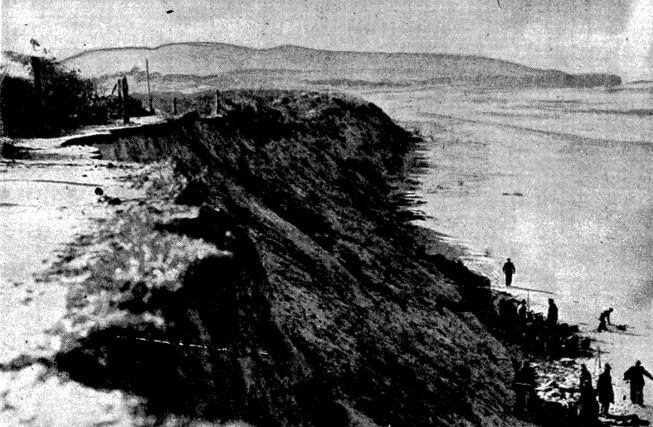 However that solidity did not last and by 1890 it was reported that the 630 feet wall built for £800 ” has all but been demolished by the sea, with the exception of 80 feet at its west, and even this portion is considerably disturbed and undermined.”Several design flaws were reported by marine engineer CY O’Connor , notably that it had been placed too far out to sea and that its foundations were “too low.” Worse was to come, when in 1891 a significant storm did considerable damage to the whole Ocean Beach area. Further storms occurred in May 1898 when the dunes themselves were breached and there was 3 feet of water in Larkworthy Street. By May 11th 1898 much of St Kilda between Ocean Beach and Cargill’s Road were inundated and houses could only be accessed by wading through water. In July 1898 the sea breached the dunes again and St Kilda was saturated with the Pacific Ocean. The passing of the Ocean Beach Public Domain Act in 1892 provided for the protection and conservation of the area known as the “sand hills”. However, this was a period of deep public acrimony and recrimination and coupled with a lack of funding was largely ineffectual. In 1894 the Board were allowed to raise funding through levying rates of a halfpenny in the pound for rateable properties in all of the city’s boroughs. However, there was catch, and the rates could only be levied by a public referendum. 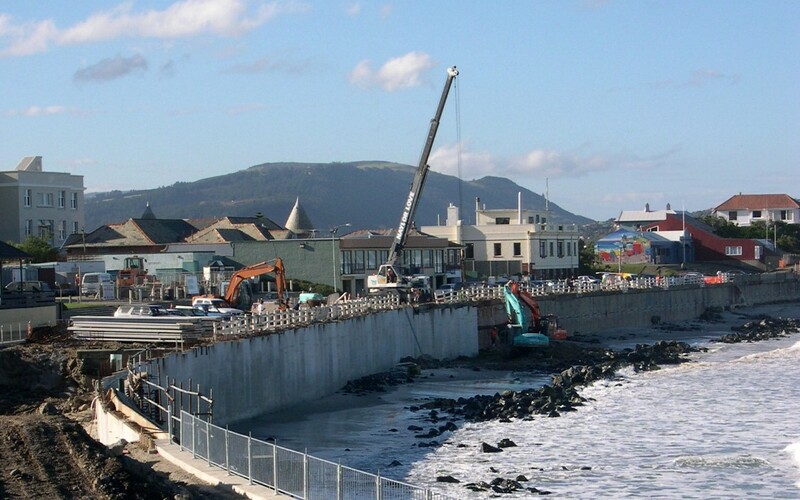 The Ocean Beach Domain Board largely took extensive steps to re-vegetate the sand dunes and construct sand trap fences to repair the dune barrier and protect the city. However, the problematic issue of the St Kilda Esplanade remained. In 1914 almost all of the sand immediately in front of the wall at St Clair beach disappeared and this was repeated to a greater extent in 1919, 1935, 1939 into the high erosional period of the 1990’s. Erosion of the beach and the dunes has become a regular historical and present day feature of both the beach and dunes immediately east of the wall. This has largely been due to the “end wall effects” where once waves reach the wall it “bounces” off them with more energy than a wave washing back off a normal sand beach. More sand is carried off shore, promoting beach loss. Seawalls, harden the coast and reduce its ability to adjust naturally exacerbating erosional problems by reflecting and concentrating wave energy and erosion. 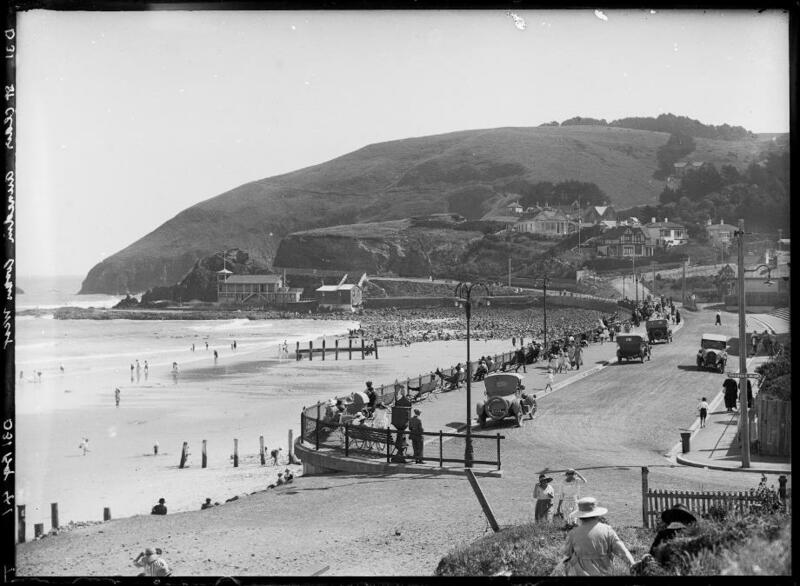 Dunedin’s various local authorities have struggled for the last 140 years to manage the coastal issues at St Clair and St Kilda. Sadly, it is a historical record of failure to understand the natural processes of the dune and coastal environment that affects the coastline that we perilously live beside. Perhaps this latest failure is an opportunity to rectify that understanding and restore the coastal environment to ensure its long term functionality as an ecological asset that provides both protection and pleasure for our city. 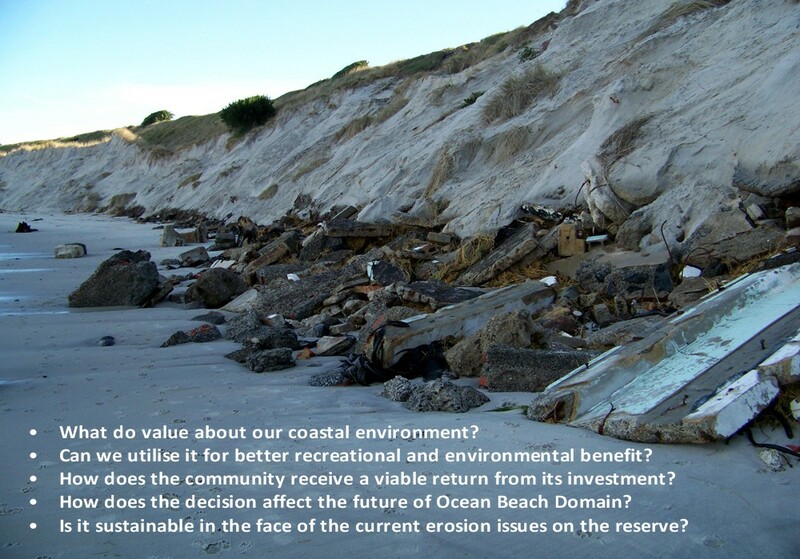 The problems with the wall and the wider erosion issues of Ocean Beach Domain cannot be dealt with in isolation, but must be integrated into a programme that deals with the coastal environment as a living entity rather than as an engineered solution. That may also mean making changes to our thinking and use of this area in the long term. History has shown our failures let’s hope that we don’t continue that trend. Members of the Dunedin Amenities Society met with Council staff and its engineering consultants this morning to review the recent bush clearance below the dam face. The clearance of any native bush area is always something that should be mourned, but the nature of the dam and its purpose has meant that it is unavoidable. Today’s inspection showed that the City Council have reduced the bush clearance from the original 5000 square metres by nearly a half and that is a very satisfactory outcome. The plan now is for the City Council to survey the site and complete their design plans for the dam strengthening so that work can begin in October. The Society raised a number of issues regarding the habitat and recreational restoration once the work was completed. Particular concerns are the opening up of the existing canopy and effects on the remaining bush edges from increased light levels now that clearance is completed. This has relevance in regards to the invasion of the area by undesirable weed species. Other issues that will come out of the next design phase will be the repositioning of the former recreational tracks. While the City Council has much to do in planning the restoration of the site, the Society can at least see a clear coherent process at work, and that provides some reassurance. Click on the photograph’s to view gallery. The protection and retention of the bush areas around the western ridge of the dam. The positioning of the proposed haul road to deliver earth fill for the proposed strengthening. The transplantation of plant material for restoration in other suitable areas. The re-use of fallen log and litter material for restoration and the creation of invertebrate habitat sites within the region. A trade-off arrangement for restoration planting in areas of Ross creek to compensate the community and biodiversity for the loss of the native bush. The site should be photographed and recorded before, during and after the operation so that structural and vegetation change in the Ross Creek area is recorded for the historical record. The removal of the significant wilding pines from the eastern side of the reservoir. The reinstatement of all recreational tracks to continue traditional access. Replanting of the dam face in shallow rooted species that are appropriate in the wider conservation and landscape context to create biological and landscape connectivity. The Society have been in communication with staff of the Dunedin City Council and will continue to do so as this project is progressed. A further meeting will be held this week as an opportunity to push the Society’s concerns and thoughts to promote the best environmental and recreational outcome for the community. The Dunedin City Council is presently undertaking a review of the District Plan and that review will mean that the Dunedin Amenities Society will also be looking at the implications of those changes. The review includes looking at creating a new open space, reserves and recreation zone which would “reflect the different types of open space and recreation areas.” The current District Plan does not recognise reserve, conservation or recreation areas as distinct entities, but rather classifies them within the zone of the surrounding land. The problem with that approach is that the activities and land use that is associated with reserve, conservation or recreation sites is often quite distinct to the surrounding land use zones. Reserve sites such as the Town Belt are often over-arched with a wider zone classification such as the “Urban Landscape Conservation Area.” Thus the rules of the District Plan override the legal protection status of the reserve under the Reserves Act 1977 without fully understanding the nature of the reserve or its values. This creates inherent problems for reserves like the Town Belt when dealing with very real conservation management issues. In one example the current District Plan actually hampers the ability of the Council to manage areas of high conservation significance. The rules (13.8.2) associated with the management of bush within Urban Landscape Conservation Areas have inadvertently protected the highly invasive Sycamore (Acer pseudoplatanus). Vegetation removal in these zones is a discretionary activity, which is infinitely sensible as it protects flora and fauna on private land. However, under the District Plan the rule “does not apply where the plants to be removed are listed in any Regional Pest Plant Management Strategy applying to the district of Dunedin City.” Here lies the conservation conundrum because sycamore is not included in the Otago Regional Council’s Pest Plant Management Strategy (that’s a whole other post at a later time). Which means that under the current Urban Landscape Conservation Area rules sycamore becomes classified as “bush” and the removal of individual mature seed bearing sycamore cannot be undertaken without resource consent. For urban reserve sites like the Town Belt sycamore has serious ecological implications for the long-term health of the reserve. 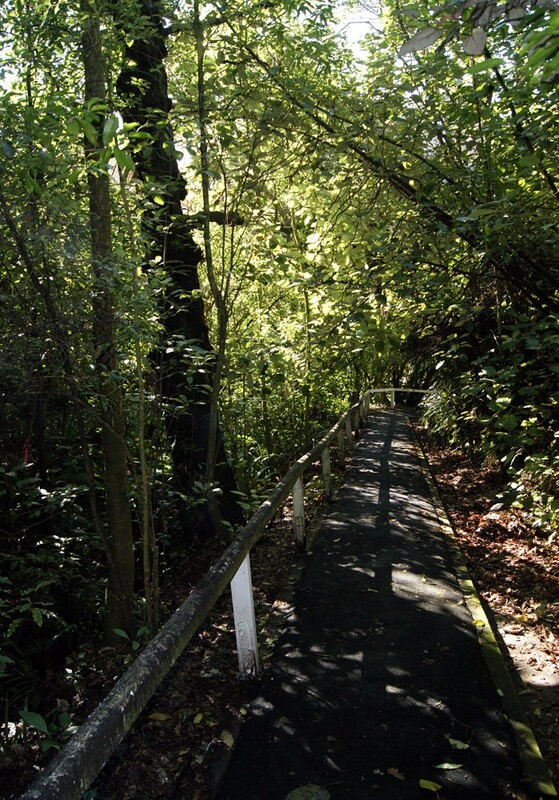 The most recent ecological assessment undertaken for the Town Belt stated that sycamore was a “most widespread and serious weed” that is able to “almost completely exclude other plants from the canopy, understory, and ground layer vegetation.” The Dunedin Town Belt Management Plan is approved by the Minister of Conservation and is a publicly consulted document of management intent which includes weed control and particularly the removal of Sycamore from the reserve. It categorically states “weed control is the management issue of prime importance if the ecological values of the Town Belt are to be sustained. Regeneration of locally native canopy tree species is being inhibited across wide areas of the Town Belt. Without effective weed control, the medium to long-term outcome will be collapse of the native forest canopy. By undertaking a public management plan process under the Reserves Act 1977 the City Council has with the approval of the Minister of Conservation (granted in 2007) indicated rightly its intention to remove sycamore from the Town Belt. There is no rational or legal argument to impose restrictions on its removal from the reserve under the provisions of the District Plan through its own muddled rules. It is quite clear to the Society in reading the current District Plan rules for Urban Landscape Conservation Areas that planners have not looked at the adverse effects of the rules in relation to the ecology of the Town Belt or other city reserves. In fact the rules actually create adverse ecological effects in relation to the removal of sycamore from reserves that fall within the Urban Landscape Conservation Areas . This is contrary to section 76(3) of the Resource Management Act 1991 which states “in making a rule, the territorial authority shall have regard to the actual or potential effect on the environment of activities including, in particular, any adverse effect.” What is also concerning is the lack of regard for the legal status of the Reserves Act 1977 and the Dunedin Town Belt Management Plan. Indeed the provisions of the Reserves Act 1977 is never mentioned in the current District Plan. Which shows that the current district Plan does not “have regard to any— management plans and strategies prepared under other Acts” as it should under 74(b) of the Resource Management Act 1991. The question that the Society asks in this example is where was the synchronised and collegiate thinking in relation to the Town Belt and other reserves during their constant ecological struggles for survival from advancing invasion of pest plants like sycamore? Another thing to consider is how do these rules effect private landowners seeking to improve biodiversity on private property? 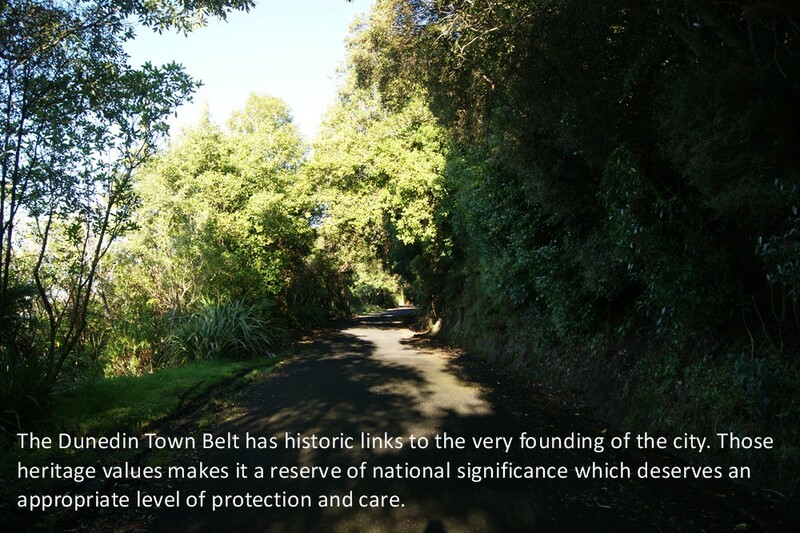 Dunedin’s Town Belt is one of New Zealand’s oldest reserve sites that forms part of the historical and landscape fabric of the city since its first survey in 1848. The importance of the reserve in that historical landscape context makes it not only a pivotal conservation and recreation reserve but a heritage site of regional and national significance. However, the undue pressure being placed upon its fragile ecology by rules that do not complement its management are likely to seriously impede its long-term health and values. The Society can only hope that this new District Plan review will undertake to give life and regard to the legal mechanisms that are already in place for the betterment and protection of Dunedin’s reserve riches. Let’s hope that bureaucracy does not get in the way of real ecological management. The drawn out debate over the use of John Wilson Drive has been centred around people’s rights to access, or more accurately their right to use that access by vehicle. The political debate disintegrated into a blatant popularity contest without any reasoned argument on what actually would provide the greatest benefit to the city. Councillors wanting the drive reopened to vehicles that spoke at the recent council meeting, only discussed their own embarrassment over the continuing issue. Not one councillor offered any clear vision for the reserve and this was the real reason that such a poor decision was made. It was never about making the right choice, it was always about councillors extricating themselves from their own lack of vision for the reserve. That speaks volumes for the people who are governing this city. 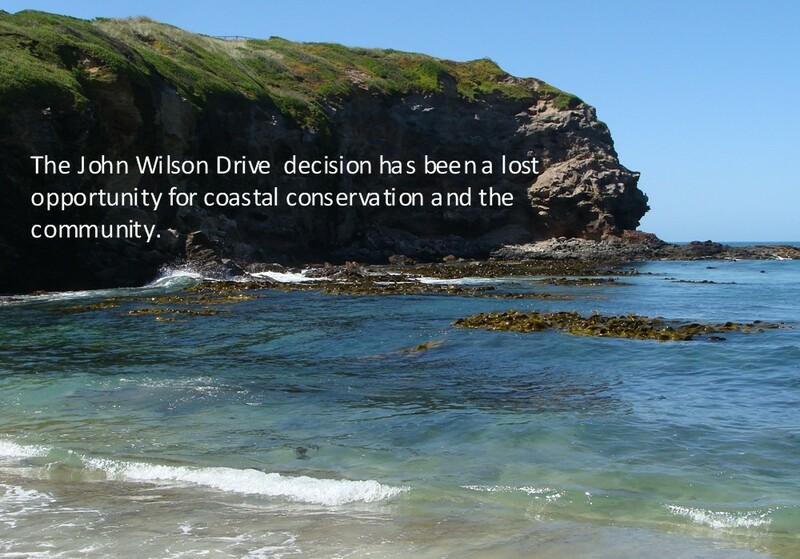 As a reserve John Wilson Drive has been set aside within the greater Ocean Beach Domain reserve for the purposes of Coastal Protection. That reserve status sets it aside with a weather eye on the protection of the city areas immediately behind the remaining dunes. In the last 20 years (and realistically for the last 120 years) Ocean Beach Domain has been under considerable environmental pressure along with the much maligned St Clair sea wall. During the last public consultation on the reserve the physical and financial recommendations to keep the reserve in a holding pattern were $4-8 million over ten years and a possible $8-19 million for retreat and further wall construction. Those estimates only include the area from adjacent to Moana Rua Road to the St Clair sea wall, which means there has been little wider consideration given to the dunes eastwards to Lawyers Head. 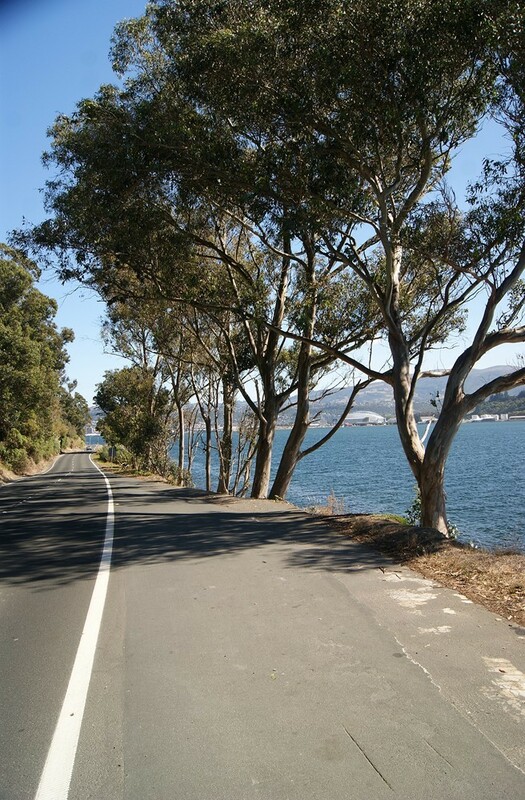 This raises the issue that the ratepayer will invest $160,000 to keep John Wilson Drive open, but has no certainty over its long-term stability. Worse, the road development continues to narrow the opportunity to repair and strengthen the dune environment for the very purpose that the reserve was created for in the first place. Given the instability and uncertainty of Ocean Beach Domain is this really the best option for the expenditure of $160,000? John Wilson Drive is an anachronism to a time when men thought they could tame nature and make it submit to the collared will of an engineers ruler. Watching the Ocean Beach dunes washed into the Pacific Ocean is proof that nature has certainly slipped its collar and the waves are barking at our heels. So what are the alternatives for John Wilson Drive? 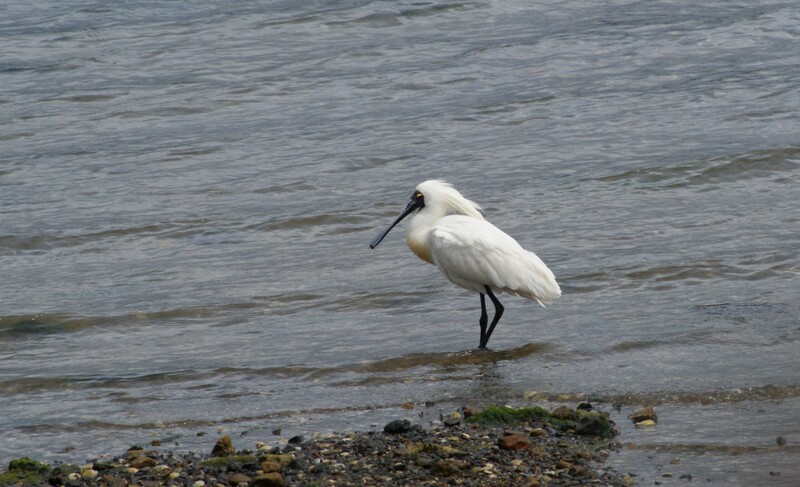 The Dunedin Amenities Society have consistently advocated that a change of use is required to ensure that the reserves dune environment can become sustainable for the future protection of our city. That change of use can provide more effective recreational, economic and environmental outcomes that will provide for the city and its community in the face of the many challenges to our city’s future. That requires innovative thinking and a deeper understanding of those future challenges, something that the Council in its “bite the bullet” mentality has failed to deliver in its recent decision. The Dunedin Amenities Society believes that by reintegrating the road back into the natural landscape with planned revegetation and removing the intrusiveness of vehicles the reserve could recover its natural form and function. 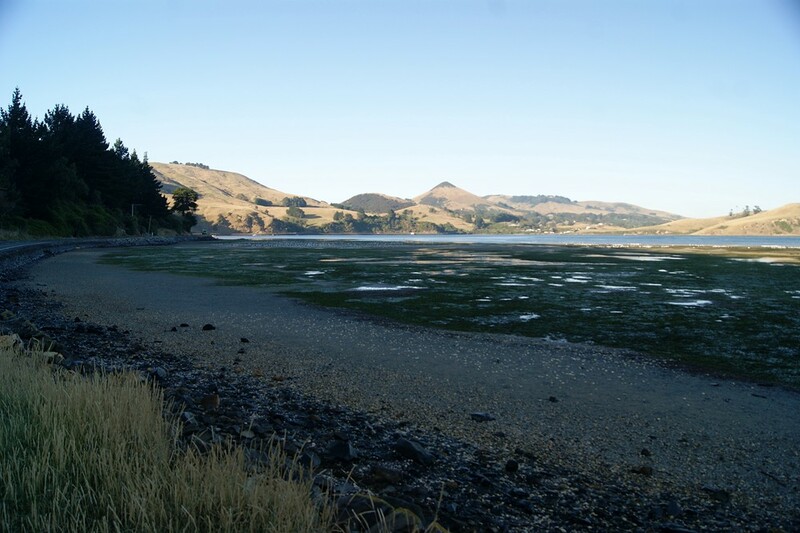 By bringing people back into this area and using creative recreational and ecological restoration the city would create a coastal space that could provide a potentially lucrative alternative link with the coast, urban centre and the Otago Peninsula. It’s not just about banning vehicles, but undertaking innovative change and development that creates opportunities for our community in a wide variety of ways. That means promoting and developing our biodiversity and landscape assets in a coherent way that adds value to the ratepayer’s investment. It also means understanding change, being brave and having a vision for the reserve that extends past the wish list for today and actually planning for tomorrow.